Stress is a major problem in the modern workplace. Does that surprise you? With our pressure to be “always on”, to work ever increasing hours for less money (in real terms, pay is falling again), is it any surprise that so many of us are stressed? Stress, and its cousins anxiety, depression and musculoskeletal disorders account for the majority of days lost in the workplace, according to the HSE. It’s also thought that up to 75 per cent of all health problems – physical and mental – are stress-related. So we know it’s a big problem. Sometimes people say they thrive off stress, but at what point does stress become problematic and begin to destroy our productivity and our health? It can be useful to distinguish pressure from stress. A certain amount of pressure is good for us. As the graph below shows, as pressure is increased on us, performance increases. But only up to a point. 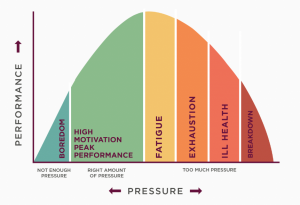 Beyond that optimum level of pressure, where our performance peaks, our productivity begins to drop. Before we know it, we’re burned out. Sound familiar? Increased awareness of stress and the problems it can cause has led to more emphasis on managing stress. That’s where mindfulness comes in. Mindfulness is a highly effective antidote to stress. When we’re stressed, we’re unable to concentrate, unable to focus. We can feel frazzled, exhausted, preoccupied with thoughts about the future or events of the past. We can freeze and actually lose the capacity to think meaningfully and purposefully. Chronic stress, as well as placing huge pressure on our internal organs, often leads to mental health problems like anxiety and depression. When we’re anxious or depressed (or anxious AND depressed), we can’t concentrate. By definition, we are unwell, and probably need to take time out of work altogether, or risk burnout. You may be able to relate to the feeling when you’ve been working flat out for weeks, or even months on end without a break, and very much feel you need a holiday. You go on holiday, and when you get back, it feels like you never left as the stress, anxiety and/or low mood come crashing back. Sound familiar? Fortunately, there is a simple way out. Start by accepting the present situation, whatever it is. Accept your mental state, your thoughts, your emotions and the physical feelings in your body. This may be uncomfortable or even painful at first, but is likely to quickly bring relief. It may seem illogical, and it’s certainly counter-intuitive, but it is by turning our attention towards these unpleasant sensations, by bringing acceptance to our situation that we begin to relieve stress. Try it right now. Firstly, ask yourself how you are feeling. Now, focus on your breathing for just a few breaths. Focus on how your body feels physically. Is there anywhere you can feel physical pain or discomfort? Bring your attention to a part of the body that feels uncomfortable, and breathe into that part of the body. You might want to do this with your eyes closed. Try this for a couple of minutes if you can. If your mind wanders, which it will, just gently bring it back to your breathing and the part of the body that feels uncomfortable. Ask yourself once again how you feel. Do you feel any differently? Mindfulness takes practice and it takes patience. Most people tend to find it more effective to learn to practise mindfulness in a group than alone. This way you get the chance to reflect on your experience with the group and thereby learn more effectively. Why not speak to your line manager or to HR about arranging a mindfulness session, or better yet, a series of short sessions for you and your colleagues to learn mindfulness practice. Life is too short to be stressed out the whole time. And of course, the irony is that when we better manage our stress levels we end up getting a lot more done.